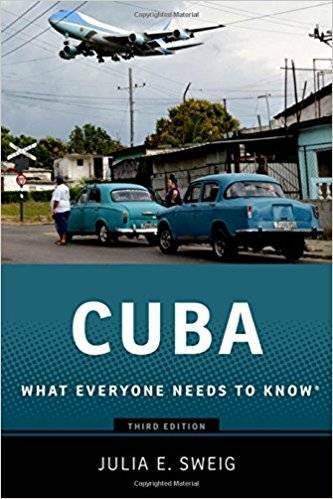 Julia E. Sweig, "Cuba: What Everyone Needs to Know, 3rd Edition"
In this third edition of the widely hailed Cuba: What Everyone Needs to Know®, Julia Sweig updates her concise and remarkably accessible portrait of the small island nation. This edition contains a new foreword that discusses developments since Obama and Raul Castro announced the normalization of US-Cuba relations and restored formal diplomatic ties. A new final chapter discusses how normalization came to pass and covers Pope Francis' visit to Cuba, where he met with Fidel and Raul Castro. Expansive in coverage and authoritative in scope, the book looks back over Cuba's history since the Spanish American War before shifting to recent times. 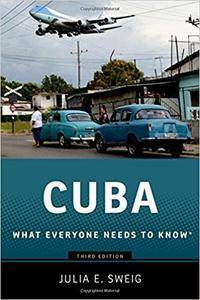 Focusing equally on Cuba's role in world affairs and its own social and political transformations, Sweig divides the book chronologically into the pre-Fidel era, the period between the 1959 revolution and the fall of the Soviet Union, the post-Cold War era, and – finally – the post-Fidel era.